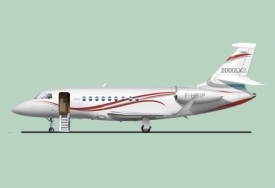 Dassault Falcon is introducing yet another new version of its popular super-midsize twin. The Falcon 2000LXS combines the range and amenities of the Falcon 2000LX with the short field capabilities of the Falcon 2000S. The new aircraft is expected to cost $500,000 more than the 2000LX (2012 $) and gain certification in 2014 when it replaces the 2000LX. As on the 2000S, the LXS features forward edge wing slats to reduce Vref speeds and takeoff and landing distances. Preliminary estimates indicate the 2000LXS will require a takeoff balanced field length of 4,675 feet at mtow, a landing distance of 2,300 feet, and a Vref of 107 knots, a substantial difference from the performance of the 2000LX (5,750 feet, 2730 feet and 116 knots, respectively). However, unlike the 2000S, the LXS does so without compromising range or payload. Dassault engineers found ways to remove 300 pounds from the wing structure, even with the addition of winglets, and 100 lbs from the cabin interior. Consequently, they estimate with full fuel the LXS will still have a range of 4,000 nm (0.8M, full fuel, six passengers, 85 percent Boeing annual winds, NBAA IFR reserves), an mtow of 42,800 pounds and a maximum payload of 2,190 pounds. Possible city pairs include New York-Anchorage, Singapore-Dubai and Beijing-Mumbai. Power on the aircraft comes from a pair of Pratt & Whitney Canada PW308C engines (7,000 pounds of thrust each) fitted with Talon II combusters that cut NOx emissions by 20 percent without any power penalty. The engines will burn 40 percent cleaner than ICAO CAEP/6 standards, according to Dassault. The aircraft’s cabin also includes a variety of improvements including better soundproofing that reduces noise by two decibels, the new Rockwell Collins FalconCabin HD+ cabin management system with HD viewing on monitors up to 22 inches and functions that can be controlled wirelessly from anywhere in the aircraft via Apple iOS devices. A dedicated application allows passengers to control entertainment, window shades, lighting and temperature. The Aircell Axxess II satcom System is standard on the aircraft and the LXS will be delivered with a restyled cockpit that includes the Honeywell Primus Epic-based EASy II avionics system. Dassault (Booth No. 3760) also confirmed that it is producing parts for its new SMS twinjet and promised to offer full details on the program next year. The 2000LSX is on track for certification next year and first year production is sold out. The 7X long-range trijet continues to sell well, primarily outside North America. The highest-time 7X has accumulated 4,000 flight hours and will soon receive upgrades including a new cabin management system, updated flight deck, higher crosswind approval, vacuum toilets and an optional shower for the rear lavatory. Overall, Dassault is on track to deliver 65 Falcons this year, CEO Charles Edelstenne said yesterday, who said the pace of global economic recovery was slow, but encouraging. Dassault is increasing its global service capabilities to reflect its growing customer base outside North America and now has 50 authorized service centers.